This remarkable real-life story reveals what happened when the author, amateur British genealogist John Daffurn, set himself an heir-hunting exercise that turned into a four-year obsession. The story begins in 2010 when John, on a whim, picked a random name from the Government’s Bona Vacantia list of more than 10,000 people who had died intestate, in a bid to discover why professional heir-hunters had not identified any living descendants to claim the estate. In the process of this ‘intellectual challenge’, which, as John states, is ‘a genealogical jigsaw puzzle that, even if it ended in failure, would enhance my ancestry research skills’, he uncovers the fascinating family histories of three men called John Campbell, all possible candidates for being the father of the deceased 68-year-old widow of interest, (Mary) Isabel Greig, who died on New Year’s Eve 1995. 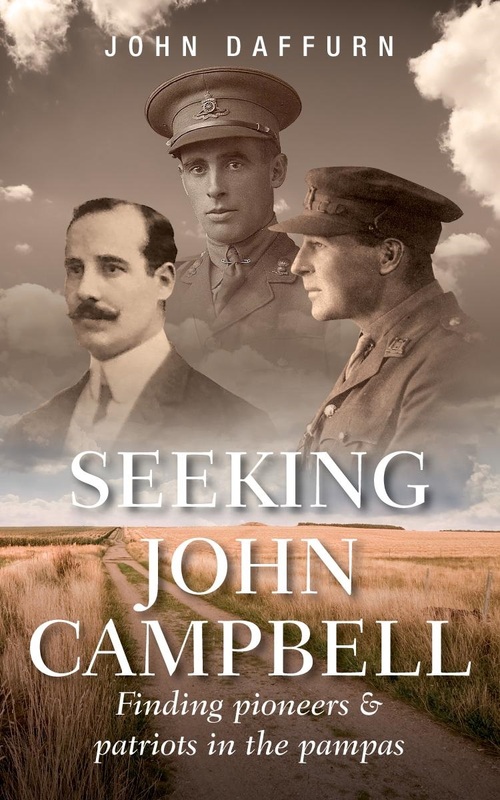 The three John Campbells’ family stories take us on a fascinating journey from Prussia and the Scottish lowlands to Argentina (where Isabel was born illegitimate), then back to Europe and the horrors of World Wars I and II. Covering the history of two families descended from the Symmetry migrants who sailed to Argentina from Leith in 1825, and a third family descended from the town’s Gibson shipbrokers, it details the impact Scottish migrants had on Argentina, and how the later world wars tore families apart. Interestingly, what started as a genealogical experiment turns into a heart-felt quest to record past lives of those lost in the mists of time, or at the very least precariously perched on the peripherals of family memory. The research undertaken is incredible – the history and biographies are wonderfully detailed, with plenty of photographs too, to picture the individuals and places involved, along with family trees to keep you on track. The delicate process of ancestral discovery – which also contains useful research tips – is woven into a thoughtful first-person narrative that never grows tired or dull. Indeed, the final outcomes of John’s adventures are touching and not entirely expected, and are something from which we can all perhaps learn. So, did he manage to identify Isabel’s family and trace living heirs to her estate? Well now, that would be telling. ISBN: 9780993147906. RRP £9.99 paperback, RRP £4.79 Kindle. Eptex. Available from Amazon. This entry was posted in Uncategorized and tagged book review, Family Tree UK, Seeking John Campbell. Bookmark the permalink.